At 3 am on September 8, I was able to finally speak with my uncle in Srinagar. “The ground floor of the house is submerged, and the water is rising,” he could say before the line got disconnected. My uncle lives in a colony built by the government in Bemina neighbourhood where even the apprehension of a flood has never existed. I was in Delhi, and could not get through to him again. The full extent of the fury of the floods in the Valley had started to become apparent. Aircel was the only functional network, and whenever I could speak to my family, the message was of distress. For hours earlier, the news from Srinagar had sounded more like exaggerated fears. Nobody had expected this fury in the Jhelum, the calm river that flowed silently through the city. But Pampore town, which lies on the banks of the Jhelum just before it enters Srinagar, had been submerged two days earlier. My youngest sister lives in Pampore. An aunt in Pulwama had floodwater in her home. Another sister’s husband and eight-year-old son were trapped on the top floor of a building in Bemina. Still, when I rushed to Srinagar, I had been hoping to travel to Pampore to see my sister and her family. I was also hoping to reach my uncle, who doesn’t even live that far. Three days later, my search hasn’t even begun. I am trapped in a safe zone created on a dry patch of uptown Srinagar city. I have made an effort every day to go to the “border”, where the dark floodwaters that have submerged neighbourhoods begin. I am torn between being a brother, a nephew and a reporter. All that I have is the hope that news from my relatives would be comforting once the waters recede. There is no way for me to even plead for a rescue boat to look for my relatives. Pampore seems in another continent. I can’t even take a rescue boat there. Standing at the point from where the Army, NDRF and volunteers are sending out boats to search for people trapped in Jawaharnagar, Rajbagh, Kursu and Magarmal Bagh, the only reassurance comes from seeing the boats return with rescued inhabitants . Even after 96 hours, there is no way to find out what has happened in the submerged areas. No government official is available to provide details. Survivors can speak of only their immediate neighbourhoods. The priority of the Army, Air Force and NDRF remains rescue. The police are trying to rebuild their fractured formations. There are no medical teams to attend to the rescued people once they are brought to dry land. The disappearance of the government has meant that a defeaning silence has descended over the story of this deluge. For Kashmir, September 7 was Black Sunday: a long, scary night spent awake watching the dark waters rise in its capital city, followed by a morning drowned in a nightmare of water that hasn’t ended yet. The Jhelum had wreaked havoc all along its meandering path through south Kashmir — and yet, the drowning of Srinagar was unbelievable, unimaginable. Even as the river rose at Sangum near Anantnag to levels where the Flood Control Department couldn’t even find their gauge, residents of the capital city believed the water would come and go, perhaps staying behind for a while in shallow pools and low- lying areas. One night early in the disaster, Chief Minister Omar Abdullah was out, monitoring the rescue of a toddler from an inundated house. His men were making rounds of places where a few days’ rain triggers fears of inundation: illegal colonies in the Jhelum’s catchment area, which have been allowed to exist because they fetch votes. Once the waters retreat, and what they have left behind in the neighbourhoods of the city emerges in full, Srinagar is likely to see a second flood — of public anger. In Kashmir's massive flood rescue operations, a group of digital volunteers - some based as far away as the United States and Singapore - has emerged as unlikely heroes, whose selfless service on social media has helped save thousands of stranded people across the devastated Himalayan region. 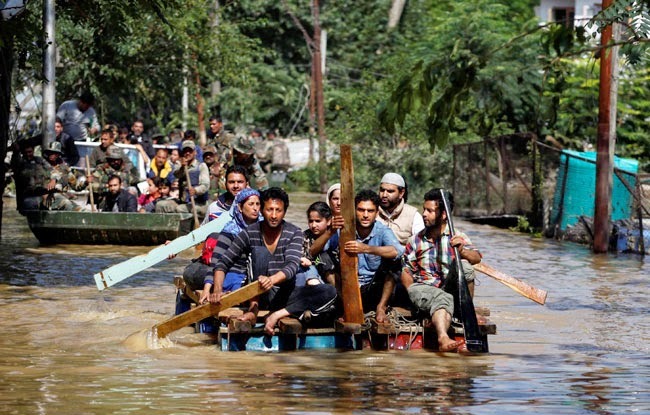 The Twitter account, @jkfloodrelief, set up by the group is among the foremost platforms curating and disseminating relief and rescue information from other users and putting it up on their handle and dedicated website www.jkfloodrelief.org. So useful is the information provided by the group that even the Indian army and the National Disaster Management Authority have been monitoring their updates and acting upon them. Initially, before communications broke down, the group, working across time zones, depended on the relatives of those stranded and contacts on the ground for information. Their experiences during similar disasters in the past - Uttarakhand floods and Cyclone Phailin - encouraged them to start their efforts early and keep them more coordinated. When telecom networks crashed, the group still managed to relay information through the army. "Our goal is to update on priority needs for relief, donation collection centers, and donation transportation logistics for public awareness on what to help via donations, where and how, and therefore, avoid mismatching of what is needed vs what is offered," said Hemant Purohit, a 27-year-old computational social scientist on crisis informatics at Kno.e.sis Center in Ohio, United States. The center has set up a dedicated 'Twitrus event' which identifies the most used hashtags and most active users, bringing their tweets together in one click. The group's efforts supplemented those of the army which used social media extensively to coordinate its relief and rescue operations. Meanwhile, the army had set up a dedicated WhatsApp group connecting all important stakeholders. All information received through social media channels are passed on to this group. Their efforts led to the rescue of a heavily pregnant woman on Tuesday. "Initially we didn't have a plan in place on to address these (messages on social media requesting help). 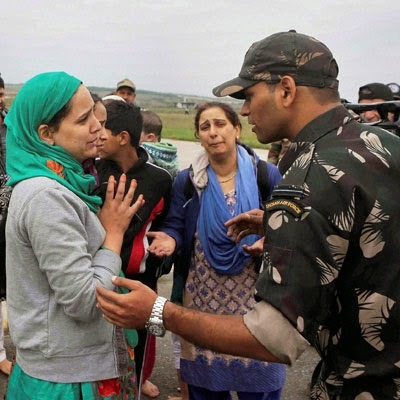 So, we put in place a WhatsApp group with all major stakeholders and started sharing these messages there to properly facilitate help," said an Army official explaining how the Indian forces are using social media. Purohit tweets and retweets late into the night about relief and rescue efforts. His colleagues, some based out of Singapore, do the same, in between managing their regular jobs. The group is amply supported by voluntary organisations and corporates such as Twitter India, Kno.e.sis Center, Google India, Cipla, IndiGo Airlines, DeVil On Wheels, Biocon, and Emami. "Goonj has supplied close to 2500kg of relief materials, Emami has supplied 560kg of feminine hygeine products, Cipla has supplied 126 cartons of meds, Indigo is supplying a large amount of basic essentials like soap, toothpaste, toothpowder, biscuits, etc. from Mumbai and is on standby to provide foodgrains, Uday Foundation has sent 200kg of relief that includes kids' clothes, woolens and medicines and Biocon is on standby to provide insulin vials," explains Bhavana Upadhyaya, another core member. DeVil On Wheels has helped the organisation build connections with on-ground volunteers. Social media organisations are not far behind as well.